The Anne and James F. Crumpacker Family Library is the region’s most comprehensive visual art resource open to students, researchers, docents, staff, and the public. 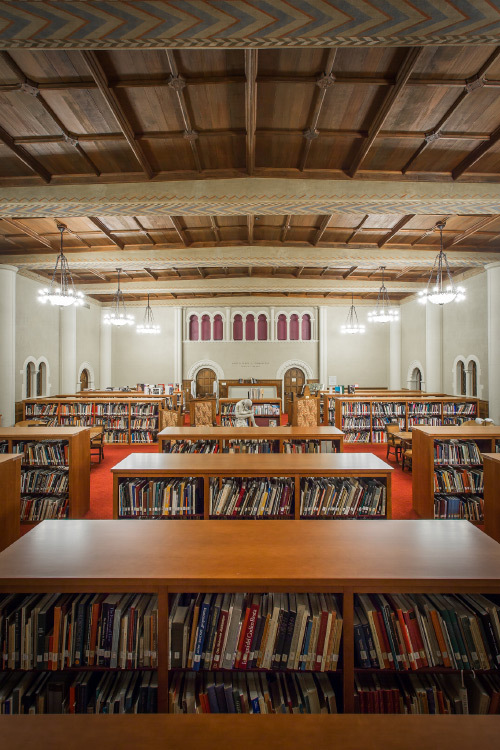 The Library’s collection of more than 35,000 volumes originated in 1895 and includes current and historical periodicals, art archives, and resources specific to the Museum’s history and encyclopedic art collection. The Library’s comfortable reading room and irreplaceable, non-circulating collection is located on the second floor of the Mark Building. The Library is open by appointment to researchers, offering public computers and wireless Internet, an audio-visual viewing station, and research assistance. Note: Docent walk-in hours are Mondays 11 a.m.-1 p.m., or you can use this form to schedule an appointment at another time. Select your preferred date and time. One week advance notice is requested. Appointments are generally available Tuesday-Friday in one hour increments. You may request more time below if needed. The Library catalog is available here. Please list titles of specific materials above, so we can pull them for your appointment. Contact the Library at 503-276-4215 or library@pam.org for general inquiries. Purchase our duplicate or out-of-scope books to benefit the Library.